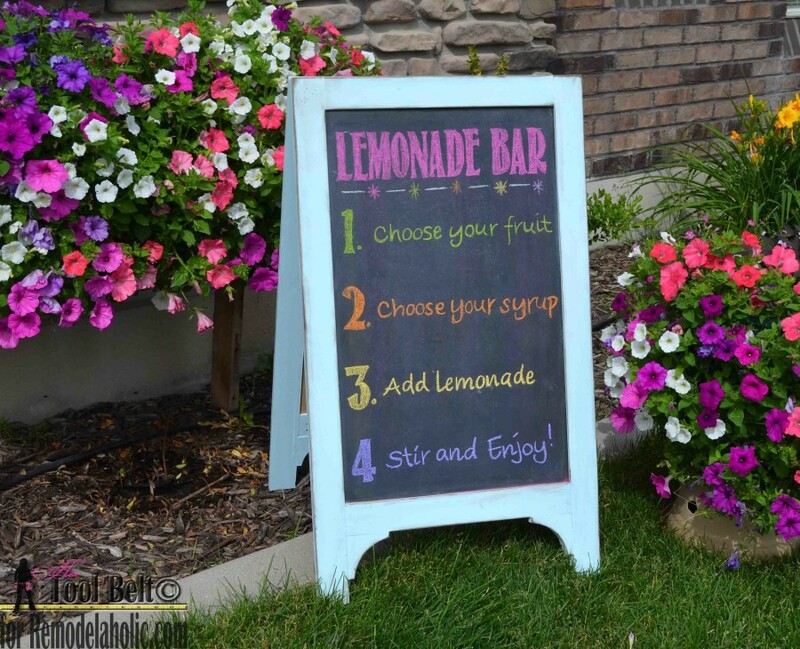 Earlier this summer I built a chalkboard easel to go with my lemonade stand for a summer social party. The chalkboard easel ended up a little bit larger than I had anticipated (42″ tall), although perfect for the party. Does that ever happen to you? A project turns out bigger/smaller than you thought it would? 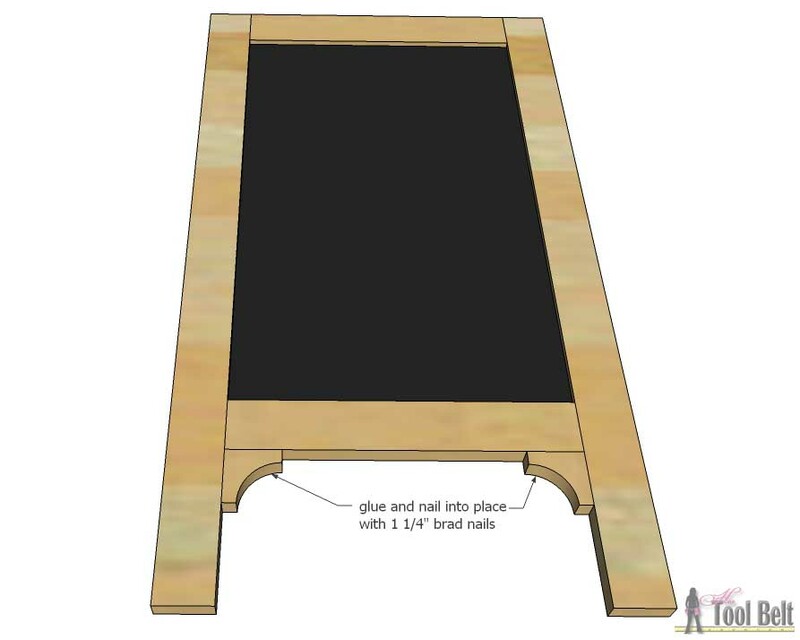 I decided to build another chalkboard easel, this time smaller to occasionally go on the front porch for holidays and such. 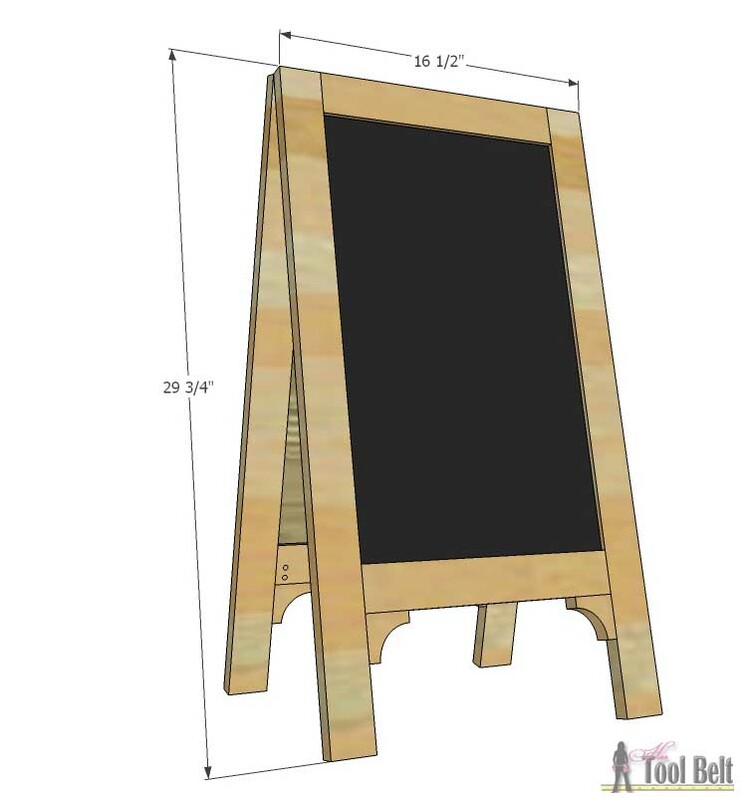 This smaller A-frame chalkboard easel is 29 3/4″ tall. Each year we have an activity with the ladies in the neighborhood and I was in charge this year. 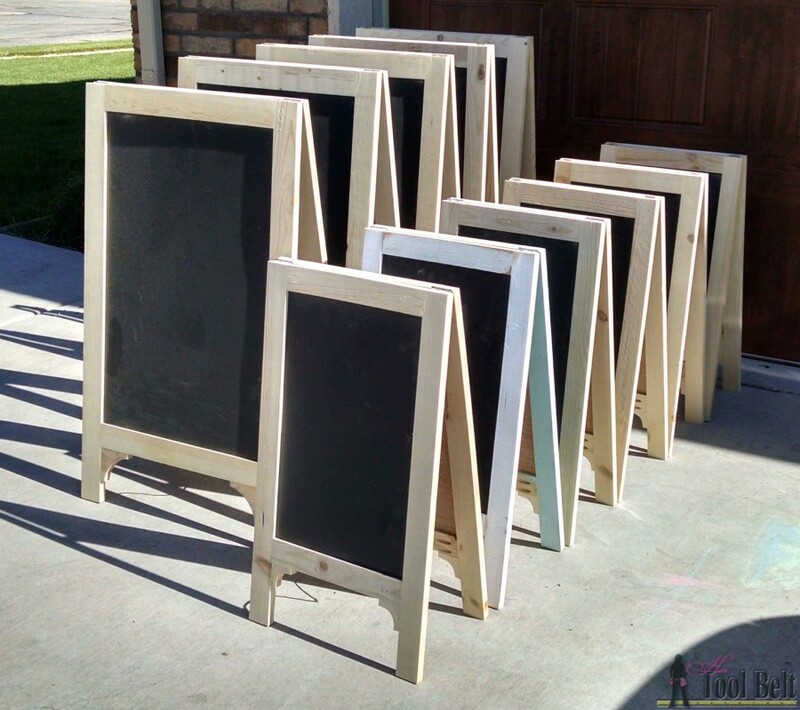 We made these chalkboard easels, it was fun and a lot of work. 🙂 So I did all of the cuts in major bulk, we made 41 chalkboard easels in all. 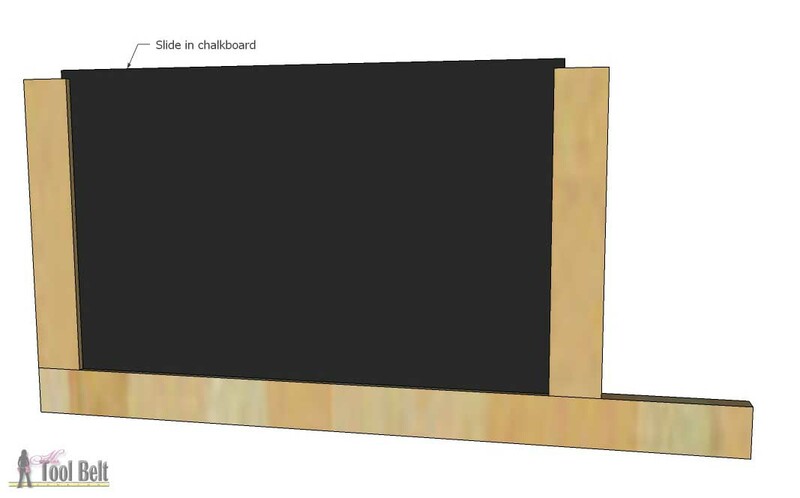 1/2 sheet 5mm underlayment plywood (sheathing), 2′ x 4′ 1/4″ mdf, or already painted chalkboard sheet. 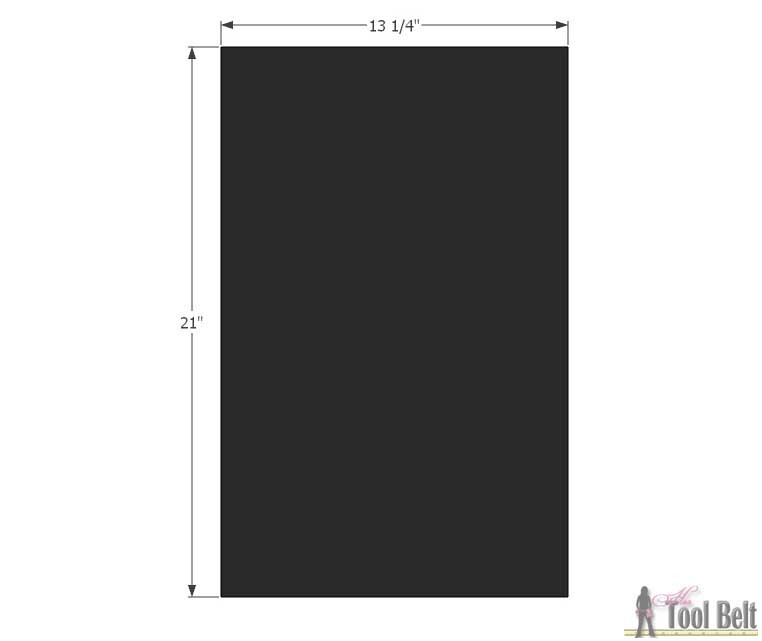 Cut out the chalkboard plywood/mdf, 13 1/4″ x 21″. Sand the good face of the plywood as necessary. Apply paint primer to the plywood. Follow the instructions on the chalkboard paint can to apply the chalkboard paint. Since I was making a bunch of these, it was so handy to use a paint sprayer. This Home Right Finish Max Pro* worked great on both the primer and chalkboard paint, a real time saver. FYI: The chalkboard paint is supposed to cure for 3 days before use. When using the cheap 1×3’s I like to trim the edges on the table saw and hopefully end up with straight edges. Trim the 1×3’s to 2″ wide. Cut 4 legs at 29 3/4″ and 4 rails at 12 1/2″. We need to cut a groove in the rails for the chalkboard to fit. 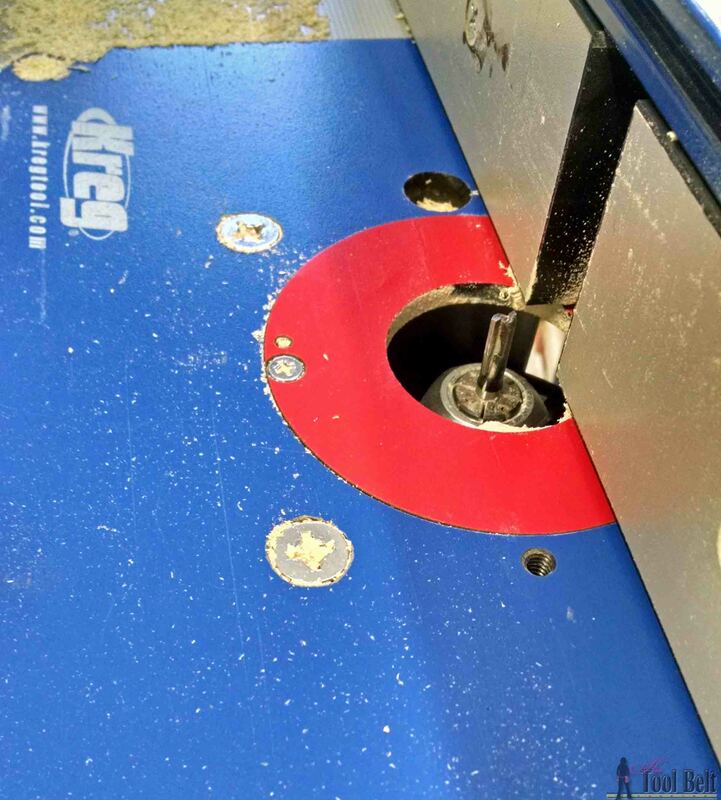 Down one of the long edges cut a groove in the middle that is 1/4″ wide and 3/8″ deep, feel free to do a little deeper to give yourself some wiggle room. 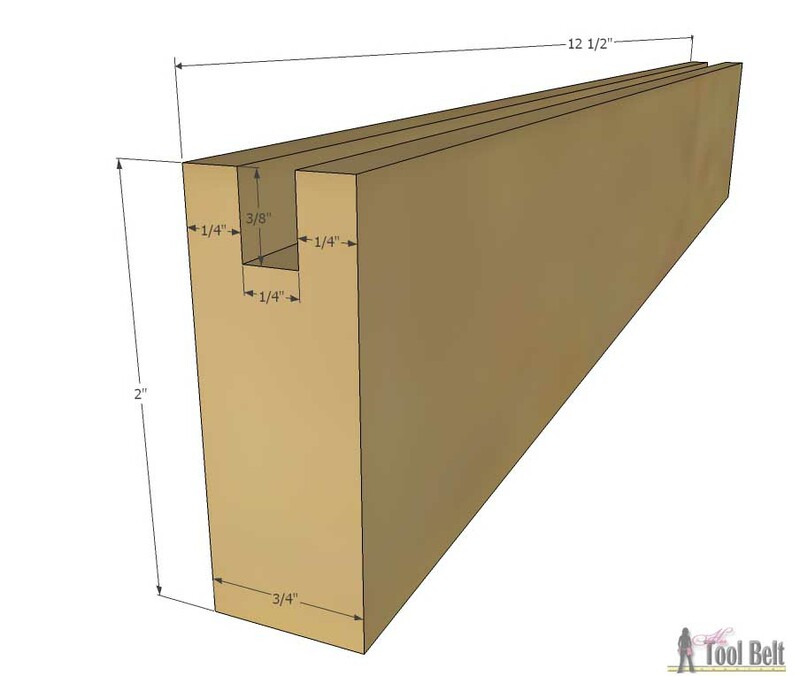 You can cut this groove on the table saw or with a router and a 1/4″ straight bit. Repeat for each rail. We also need to cut the groove in the legs, starting from 1 5/8″ from the top to 7 1/8″ from the bottom. Center the groove and cut it 1/4″ wide and 3/8″ deep. This is easiest done with a router and 1/4″ straight bit. Dry fit the chalkboard and make sure it’ll fit in the groove. Drill pocket holes* in both ends of the backside of the rails. 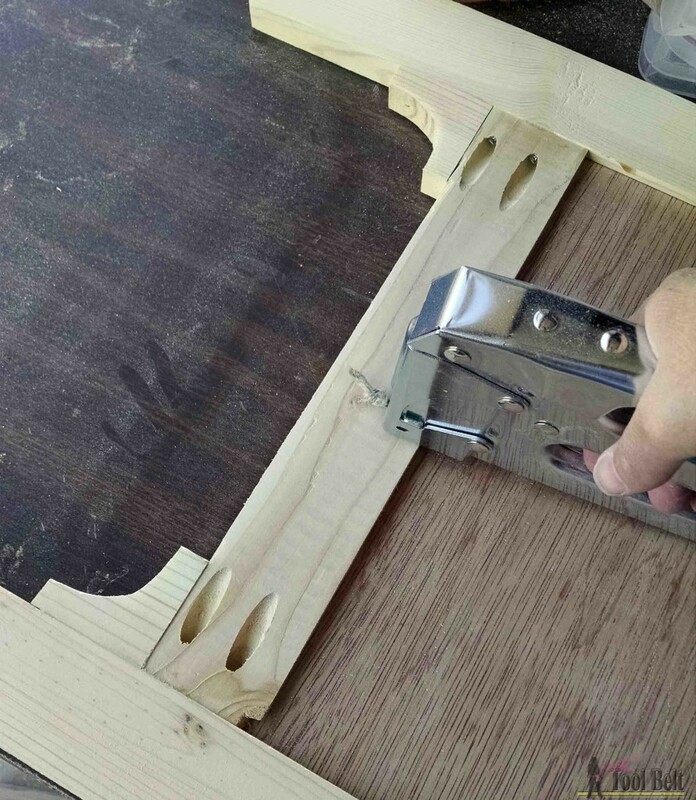 You’ll want to try and keep the pocket holes away from the edge you cut the groove. On each of the legs, measure and mark down 24 1/4″ from the top. This is where the bottom rail will end. Note: you may want to consider painting the edges that have the chalkboard grooves before assembling the frame. Glue and clamp a rail to the top of one of the legs. 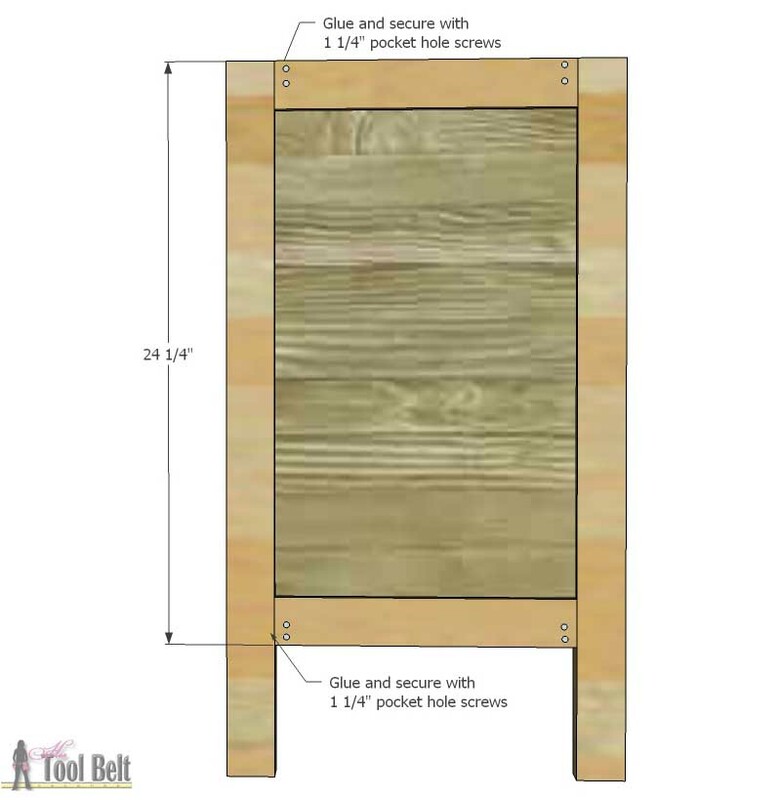 Secure the rail with 2- 1 1/4″ pocket hole screws. 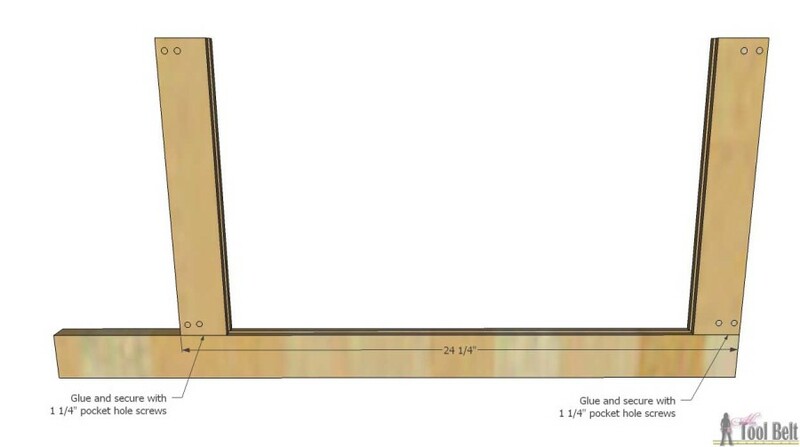 Glue and clamp another rail at the 24 1/4″ mark, secure with 2 – 1 1/4″ pocket hole screws. Slide the chalkboard into the slot. Make sure the good side of the chalkboard is on the opposite side of the pocket holes. Glue and secure the other leg onto the rails. With some of the scrap 2″ piece, cut 4 pieces that are 2″ x 2″. 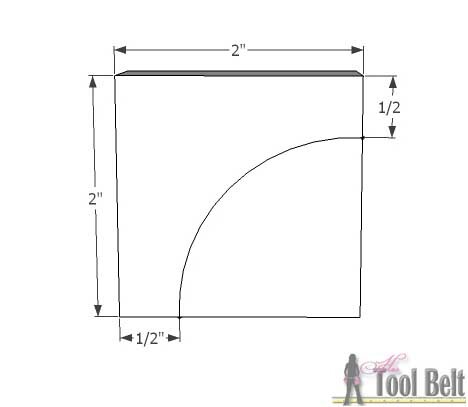 Mark about 1/4″-1/2″ from opposite corners and use a round object to trace a curve. Use a band saw, scroll saw or jig saw to cut out the corbels. Glue and nail the corbels into the bottom corner of the frames. To assemble the chalkboards, lay the board back face up. Separate the boards about 1/4″. 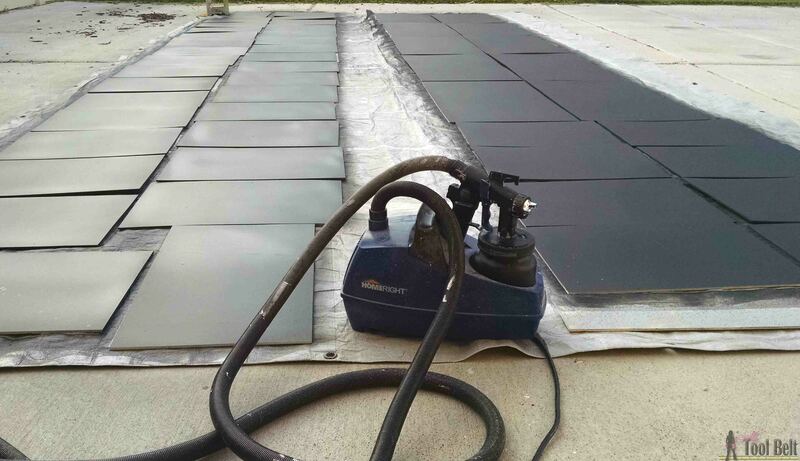 Lay out the hinges and make sure you orient them so when installed, they will close. Mark the hole centers and drill pilot holes for the small hinge screws. Secure the hinges with the screws. Tie a knot in each end of the string and staple to the inside of the chalkboard easel. Here’s a few of them assembled, large and small. Fun Fun! 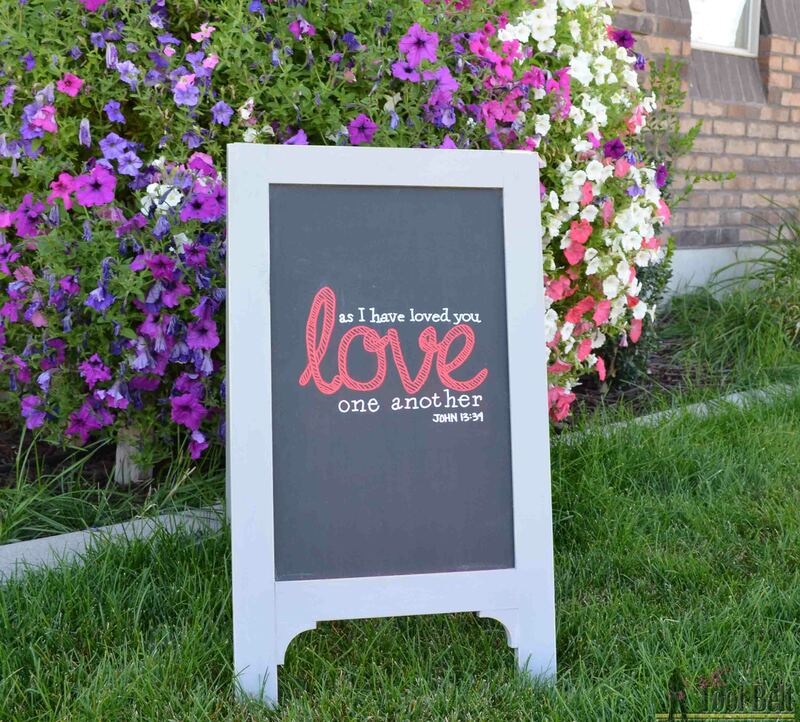 Sand the chalkboard frame finish with 120-150 grit sandpaper. I used Amy Howard at Home One Step Paint in Atelier (gray) to paint my frame. Once the paint was dry, I lightly distressed the frame edges with sandpaper. 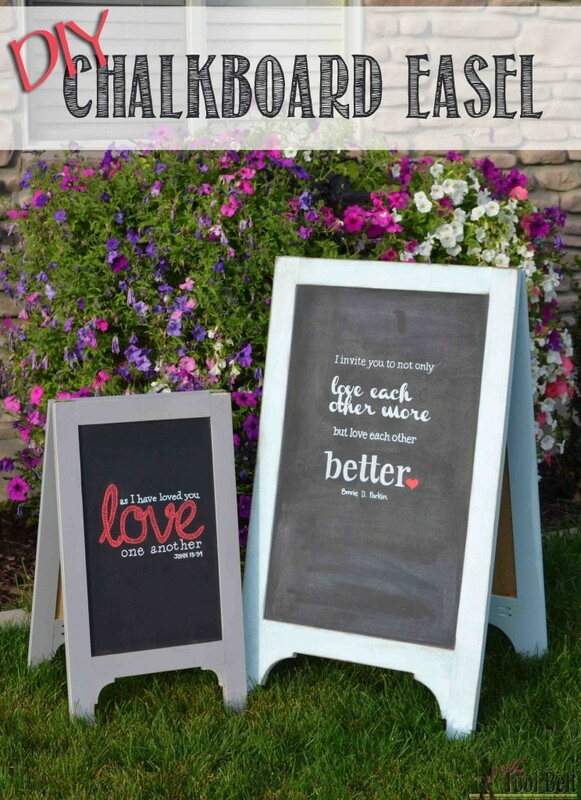 Thanks to my friend Wendy for doing the word art on these chalkboards! First, let me compliment you on a well organized project and plan and the project layout. I had no use for a large sign like you built. So I shrunk it down to a board that I will now have my desk top. I would have never even thought to do this had I not seen your black board. I made one slight adjustment to your project. I used a piece of white board that I had left over. I just use the wipe away pens instead of chalk. You are amazing! I love all your projects!!! Such great plans Amy! And I still can’t believe you “got” to make all these…..holy quac!! I love them!